Lemony and buttery is how I would describe this delicious Lemon Poppy Seed Bread. Brushing the baked bread, while still hot from the oven, with a sugary lemon glaze makes all the difference. The glaze adds a nice citrus flavor and permeates the bread to make it tender and moist so it will keep for days. 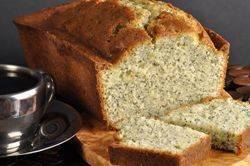 This Lemon Poppy Seed Bread is like a pound cake. It has a good buttery sweet flavor, offset by the tanginess of the lemon glaze. Lemons have the ability to bring out the best in baked goods. For this recipe we are using both the outer yellow skin (zest) of the lemon, plus its juice. The grated lemon zest (the outer yellow skin) is added to the batter, and this is actually where the lemon hides most of its flavor. Since we are grating the outer skin of the lemon I try to buy organic for some commercially grown lemons are sprayed with insecticides. But, either way, it is good practice to always wash your lemons thoroughly, that means with soap and water, before using. Another addition to this Lemon Poppy Seed Bread bread is black poppy seeds. They look lovely dotting the bread and add a delightful crunch. (You can adjust the amount of poppy seeds to your own personal taste.) Some people cannot easily digest poppy seeds, so to help with this problem you can first soften the seeds by soaking them in the milk (called for the in recipe) for at least 30 minutes before making the batter. Now, poppy seeds are the kidney-shaped, tiny ripe black seeds of the opium poppy plant and Tom Stobbart in his 'The Cook's Encyclopedia' describes their flavor as "pleasantly nutty, a little like sesame seeds, and perhaps rather nicer". Although around the world they are used in both sweet and savory dishes, here in North America poppy seeds are used mainly in cakes, cookies, and breads. Lemon Poppy Seed Bread: Preheat oven to 350 degrees F (180 degrees C) and place the oven rack in the center of the oven. Butter and flour, or spray with a non stick vegetable/flour spray, the bottom and sides of a loaf pan (8 x 4 x 2 1/2 inch) (20 x 10 x 7 cm). Line the bottom of the pan with a piece of parchment or wax paper. In a separate bowl, whisk together the flour, baking powder, salt, lemon zest, and poppy seeds . In the bowl of your electric mixer, or with a hand mixer, beat the butter until softened (about 1-2 minutes). Add the sugar and continue to beat until light and fluffy (2-3 minutes). Add the eggs, one at a time, beating well after each addition. Scrape down the sides of the bowl as needed. Beat in the vanilla extract. With the mixer on low, add the flour mixture (in three additions) and milk (in two additions) alternately, starting and ending with the flour. Mix only until combined. Scrape the batter into the prepared pan, smoothing the top with the back of a spoon or an offset spatula. Bake for about 50 to 60 minutes, or until the bread is golden brown and a toothpick inserted in the center comes out clean. When the bread is done, remove from oven and place on a wire rack. Immediately brush the top of the bread with the hot lemon glaze. Cool the loaf in the pan for about 20-30 minutes then remove from pan and let cool completely on a wire rack. This bread is best when stored overnight to allow the glaze to be absorbed into the bread and to allow the flavors to mingle.